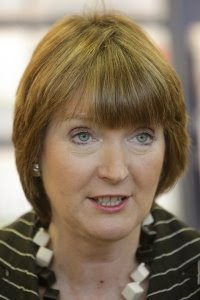 Harriet Harman is becoming like a big, puss-filled zit on the PM's face. She's distracting the public from what Brown wants them to look at. But he can't squeeze her to get rid of her because it'll only make things worse. I just got back from the morning's lobby briefing where PM spokesman Michael Ellam was bombarded with questions about Fred the Shred's pension. - Whether the Government would change the law to get back his pension (see below). - Whether any law change would be retrospective. - Whether they were ruling out a law change. - What the PM thought of Harman's comments. - What Harman might have meant when she said the Government would "step in". Pretty much every hack who asked was simply told the Government had "asked lawyers" to explore every legal option to address the issue. It totally overshadowed Brown's visit to see Obama. No doubt Harriet will be smirking. She's taking PMQs on Wednesday in Brown's absence. Expect Hague to have fun with it all. Good to have this stuff straight from the briefing Joe. Having read the Guardian's legal briefing it seems Fred is pretty safe. He has a legal right to it and new legislation would be needed to wrest any of it from him. And he care's not one jot what we think. The reptile.